A Most Wanted Man is an old-fashioned spy story with all too current stakes. Based on the John le Carré novel of the same title, the characters are weary but dogged — if we like them. The others….slither. 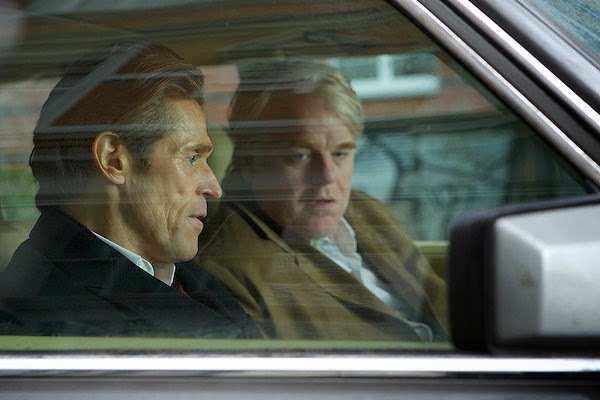 In his last film, Philip Seymour Hoffman plays a German spy named Gunter Bachmann who acknowledges that he commits acts against the German constitution while trying to keep tabs on and track down potential terrorists. He is the quintessential John le Carré spy, ever out in the cold, sad, lonely, probably an alcoholic, and dedicated to protecting the world, his contacts, and his own belief in what is just, which is not the same as legal. The time is now, the city is Hamburg, and it is shocking. I haven’t been to Germany since before 9/11, but I cannot recall litter except in the vicinity of U.S. army bases, or graffiti anywhere. In today’s Hamburg, both are everywhere. The light is harsh — the sun doesn’t shine, it glowers in a garish show of illumination without warmth. Gunther trusts no one in the German political arena and certainly not the American (represented with chilling arrogance here by Robin Wright, her façade clean, modern, even chic). Gunter will use entrapment, extortion, blackmail, cajoling and hugging to get what he wants from the informants he has cultivated into his network. This is all for the greater good, and he at no time wishes to use violence in his network. That’s for the Americans. He will use threats of deportation, he will kidnap and intimidate. He coerces young Jamal (Mehdi Dehbi) to sneak and spy on his own family and mosque, and just how far Gunter expects his network to go is shocking. Robin Wright as the American, Hoffman as the German. Photo Credit: Roadside Attractions. Performances are low key, realistic, frightening. Claire Simpson’s editing carries us along, shocks us, stops us, tosses us forward into the sliced and slivered scenes. The shots are stark, the lighting cold, the river lifeless. This is a new cold war and it drains the color out of everything in Benoît Delhomme’s cinematography. We become part of Gunter’s team, so it is “we” who are following two men — a wealthy philanthropist who may be funneling money to terrorists and a Chechen Muslim who has entered Germany illegally, seeking asylum. Abdullah, the philanthropist, appears to be suspected just because he’s Islamic. He is sophisticated, kind, and beautifully played by Homayouin Hershadi. The other subject of surveillance, Issa Karpov, appears like a homeless person on the brink of a psychotic break. He is suspected of being a terrorist, particularly since he confessed to committing terrorist acts when tortured by the Russians. But, as Irna states, who wouldn’t, when under torture by the Russians. We are all breakable. Issa (born Ivan) reveals himself extremely slowly in Grigoriy Dobrygin’s searing portrayal. The Chechen finds refuge with another Muslim family seeking asylum in Germany, a Turkish mother and son. Another network. These people reach out to their lawyer, Annabel Richter played by Rachel McAdams, to try to get asylum and make contact with a banker who has something belonging to Karpov. The lawyer is left wing and idealistic, or she’s just doing the opposite of what her family wants her to do. She rides her bicycle all over Hamburg but can go to high or low society. The character and her actions are totally predictable and Ms. McAdams does nothing to make it more. Rachel McAdams and Grigoriy Dobrygin. Photo Credit: Roadside Attractions. Rainer Bock is chilly as the angry German agent Dieter Mohr, working for an agency that is not clandestine. To fend off this short sightedness, Gunter even talks to the Americans in hopes of gaining an ally for his longer-term and much smarter intentions. Willem Dafoe is a well-heeled banker, angry, beautifully dressed even without comparison to the slovenly Gunter. The banker’s wife sits at home, seen from outside as if on display before floor-to-ceiling windows, dressed for an evening out in a tight sheath and high heels, or perhaps for a photo shoot. She is not going anywhere. This is a house not a home, an artist’s lifeless rendering of high fashion and just as stiff. Everything’s a pose, roles for the playing in the proper setting. Modes of transportation helped delineate character: Issa came to Hamburg by mass public transportation, Annabel rides a bicycle, Gunter drives an inconspicuous old sedan, and the banker has a beautiful sleek machine that screams “Look At Me!” One wonders if he’ll change cars at the end of the story. Willem Dafoe and Philip Seymour Hoffman. Photo Credit: Roadside Attractions. Delhomme’s cinematography combines with Sebastian T. Krawinkel’s production design which engenders claustrophobia in both tightly enclosed spaces and open ones with long, empty views. The images contrast the work done and lives lived in the shadows — Gunter retreats to the underground world of rathskellers — with the not-clandestine German government and the glamorous American meeting in high rise offices and restaurants with plate glass windows and strategic views. There’s nothing pretty to look at no matter how high. Director Anton Corbijn skillfully manipulates us as Gunter manipulates his network and his team. It’s exhausting. Corbijn takes his time, lays out the story, lets us come to know his people. We care about them. This is no typical American thriller. Occasionally some driving is rather fast, but nothing else. Except the abrupt ending. Andrew Bovell’s screenplay (based on le Carre’s novel) is brusque, brisk, and as chilly as the cinematography, lending layers to each individual we meet. The actors do finely detailed, subdued work in this subdued world. Grigoriy Dobrygin’s Issa allows us in as carefully as an abused animal, shaming our assumptions about him. Robin Wright’s American is that brittle sophisticate, cold as ice, an adept listener with unfathomable eyes. I recently read an article about le Carré and his ever-growing dislike of America. Believe it. It’s right there on the screen. As for Mr. Hoffman. His performance is so naturalistic, he is so subsumed into the person of Gunter with Gunter’s entire life always alive in him, he becomes Gunter. Consequently Gunter becomes our representative in the story, his view becomes ours. We are in Gunter’s head, we become him. Betrayal of Gunter is betrayal of us. 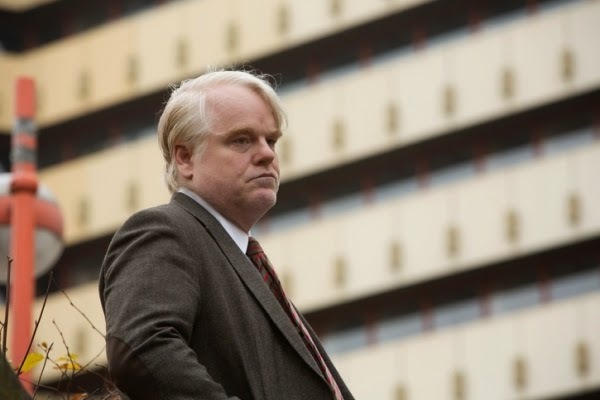 That is the power of Philip Seymour Hoffman. He is already missed. The power of le Carré and Corbijn and Bovell is the niggling feeling that the next time you’re in a pub or on a train or getting into a taxi, you will look around you and wonder who’s watching. Or you should. ~ Molly Matera, signing off to read le Carré’s novel, which I assume will leave me as depressed as this thrilling film did.